Intuition II was asking $4,950,000. The 59 metre motor yacht Intuition II, listed for sale by Pam Barlow at Luke Brown Yachts, has been sold with Jeromy Mold of Worth Avenue Yachts introducing the buyer. Built in steel by Dutch yard Amels, she was delivered in 1974 named Spica, one of three pilot cutters built for the Netherlands Pilotage Authority. The owner’s captain later discovered her in Rotterdam and she was purchased and taken to the UK yard Vosper Thornycroft for conversion to a luxury yacht in 1997. Southampton Yacht Services was contracted to produce the technical specifications for a project including replacing her superstructure with one in aluminium while Nicholson Interiors were commissioned to design a new interior. All old systems, including wiring, electronics, insulation, heating, air conditioning and plumbing were torn out and replaced with new, and she emerged from the yard in 1998 as Intuition II. The new interior makes full use of the 10.67 metre beam to incorporate a saloon on the main deck and a further, primary, one on the upper deck, which is connected to a library and formal dining area. The décor throughout is in dark mahogany wood joinery, light overhead panels with floorings in fine marbles interspersed with carpeting. Suitably palatial accommodation is for 15 guests in eight cabins consisting of a master suite on the upper deck with panoramic views through forward-facing windows, two VIP suites on the main deck forward of a single berth nanny cabin plus two doubles and two twins below, all with en-suite shower facilities. There are quarters for 15 crew in 10 cabins although Intuition II normally needs just 12 crew. She still retains her original triple 650hp Deutz diesel-electric engines giving her a cruising speed of 10 knots and a range of 6,500 nautical miles. 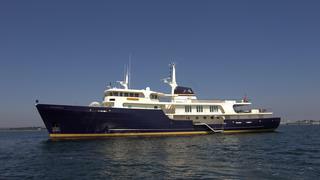 Lying in Sag Harbor, New York, Intuition II was asking $4,950,000.